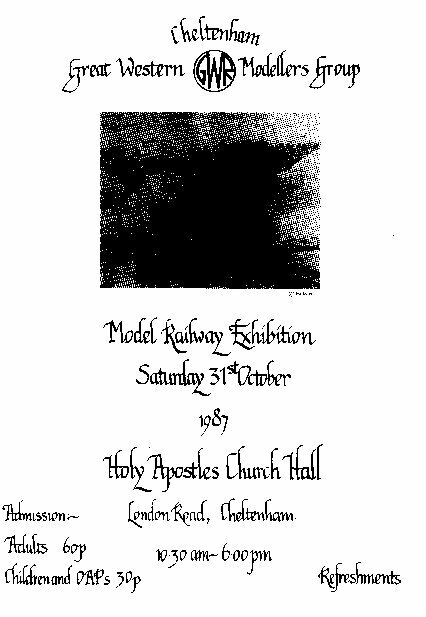 GWR Modellers Group held its first model railway exhibition in October 1987 in the Holy Apostles Church Hall, Cheltenham. Ten layouts took part. Thereafter exhibitions were held at first every other year (alternating with exhibitions promoted by a Cheltenham 3mm group) and then annually. More recently, exhibitions have been held twice yearly, in April and October, and on two occasions a third exhibition has taken place. GWR Modellers Group was started in 1974, when it rented a basement room in Lansdown Crescent. In October 1977, new premises were provided and a garage was converted into a clubroom. Space restrictions, however, were always a problem, which limited the number of members. In 1993/4 it was decided that the club should fold. However, because of the success of its exhibitions, it was decided to continue to organise these in order to display other people's layouts and to benefit the charity CLIC. The exhibitions continue, under the direction of Secretary, Mike Walker.